All-time World Series of Poker gold bracelet leader Phil Hellmuth is in a great position to win his record-furthering 13th as he will enter the WSOP Europe main event final table with the chip lead. A total of 420 players posted the €10,450 buy-in in the second largest WSOP Europe main event in the event’s six-year history, building a €4,032,000. 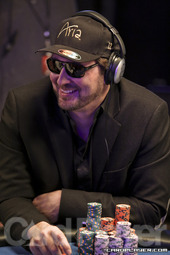 Hellmuth will be in the pole position to take the €1,022,376 first-place prize, but will face stiff competition. Joining the “Poker Brat” in the final eight are 2010 WSOP main event third-place finisher Joseph Cheong, who will enter the final table third in chips, and two-time WSOP bracelet winner Jason Mercier in seventh chip position. The fourth day of play in this event began with a field of 24, and it was overflowing with notables. Those who fell short of the final table include Joe Kuether (24th – €26,611), Andy Frankenberger (22nd – €26,611), Liv Boeree (18th – €26,611), David Benyamine (15th – €32,256), Kyle Julius (14th – €40,320), Toby Lewis (13th – €40,320), Steve Dannenmann (12th – €52,416), Scott Seiver (10th – €66,528) and Tim Adams (9th – €66,528). As long as Phil can avoid mental game problems. He should win. If he gets over confident he can kiss it good bye.